The guide on any holiday is critical – he needs to be informed, knowledgeable, sensitive, with a good sense of humour and fun. 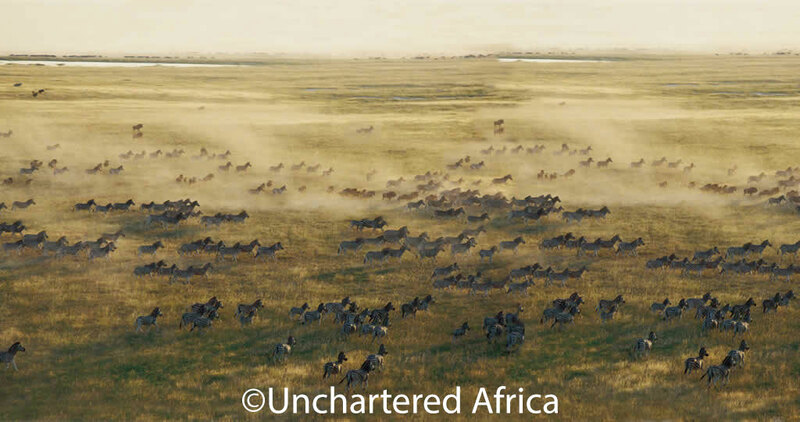 And this is especially true on safari where you spend many hours with your guide. We therefore choose our guides very carefully and believe we have a wonderful team that will give the best safari possible. I enjoy spending time with multicultural people, from all over the world. Because of this I have developed a keen interest in speaking German, French and Italian. 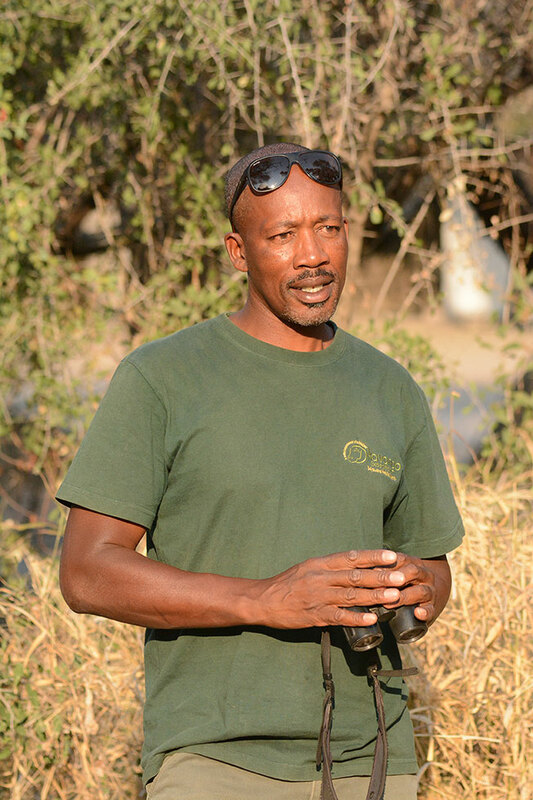 I have been guiding for over 20 years and learn new things everyday – Nothing beats the knowledge you acquire when you guide a multitude of different nationalities throughout Botswana. In September 2014 I was on a boat cruise in the Okavango Delta with my guests. I spotted a leopard up a tree, hanging on a branch over the river channel – a very rare sighting. I realised the leopard was very relaxed and curious and was looking at the boat drifting past. All of a sudden we heard a loud sound… “BOOF”! I then realised that the leopard was now on the opposite side of the channel? Yes, the leopard had waited for the boat to be in the right position and had used the boats canvas roof as a bridge to get over the waterway and not get wet! Having been raised in a guide’s family where my father, uncle and cousins were all guides, my passion for the bush came from their stories and the light that shone through their eyes as they retold these stories. 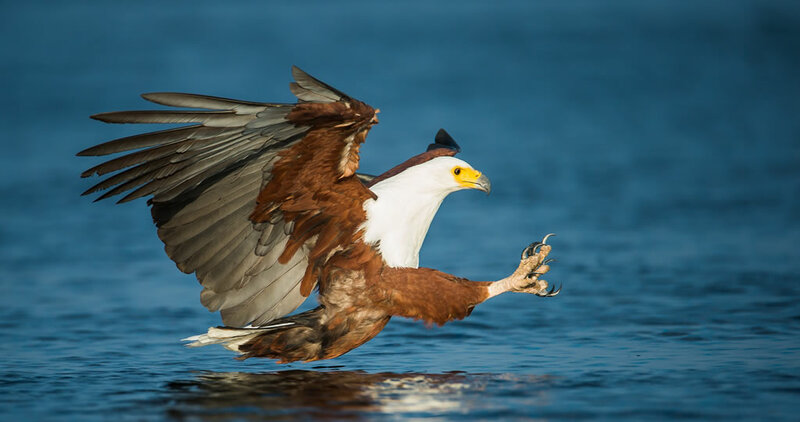 This on top of having grown up in Maun (The Gateway to the Okavango Delta) and being surrounded by wildlife and the beauty of nature, I fell in love with the wildness and so it became my career. I have now been guiding for over 17 years and have the same passion and love I have for the bush as I did when I began. I love sharing my passion and my home with people, and as I remind every guest, I have the best job in the world. During an afternoon game drive, on a very hot day of middle October I went to visit one of the water holes known as Pump Pan in Savuti. We discovered a hippo in the water, a small bachelor herd of elephant and the famous lion pride called the “Marsh Pride “. All of the animals were drinking together at the same water hole. A herd of buffalo comprising 7 males and 1 pregnant female joined the other animals to drink. But then lions started to show a strong interest in the buffaloes. The pride observed them and chose the easiest target… the female! The pride male brought her down after a relatively short chase proving that male lions are competent hunters even in the presence of lionesses. Sam is the best guide. He made sure we had a chance to see everything! I was born into a tourism and travelling world. My parents gave me the amazing chance to travel a lot and to give me the passion for the wild… I grew up between Europe and Africa. I am a qualified landscaper in France but after 6 years I was missing Africa and came back to build a lodge for a Masai community in Kenya. Back in Paris I asked myself “What am I doing here?” and bought an air ticket to Botswana. I now live and work in Botswana since 2014 and have a passion for the wilderness. 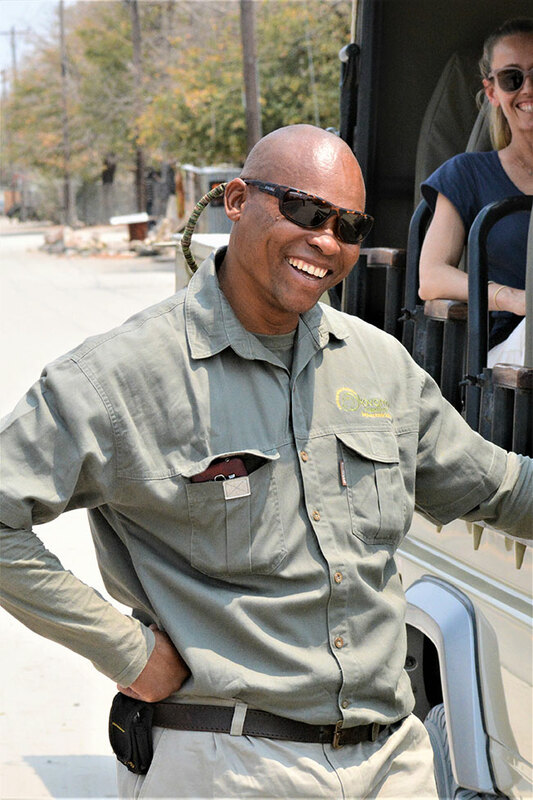 A qualified Botswana Professional Guide I lead our French speaking safaris. I love my job, I love Botswana. Come visit i will take you to the bush. Just before sunset I spotted a leopard up a tree in the Khwai region of Moremi. As we get closer I realised that it was a dead warthog being eaten by a beautiful male leopard. While waiting and observing the leopard I realised that leaves were falling from the same tree but not from the side of the leopard. A second leopard a young female was up the tree obviously displaced by the big male. 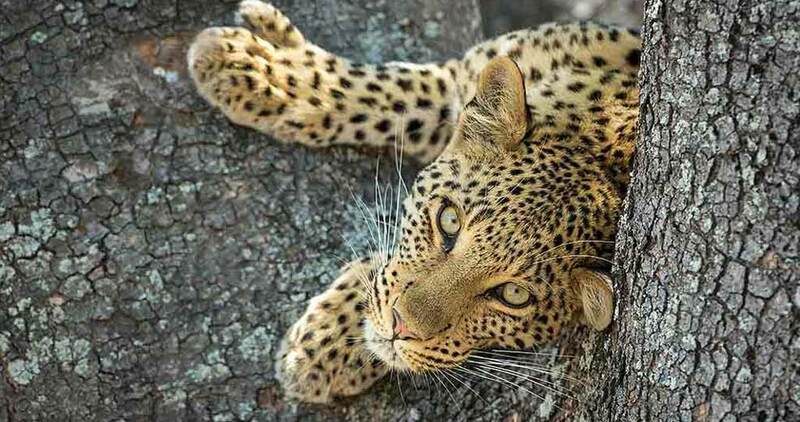 Woah – 2 leopards in the same tree! Even more excited my guests could not stop taking photos. After few minutes, the big male started to act strangely was agitated and focused on the ground… A third leopard appeared… another female …BAM!! 3 leopards at the same spot – unbelievable! I soon realised that the smell of the kill was alarming other predators. A spotted hyena joined us searching for scraps when all of a sudden the hyena and the leopard on the ground suddenly ran away? 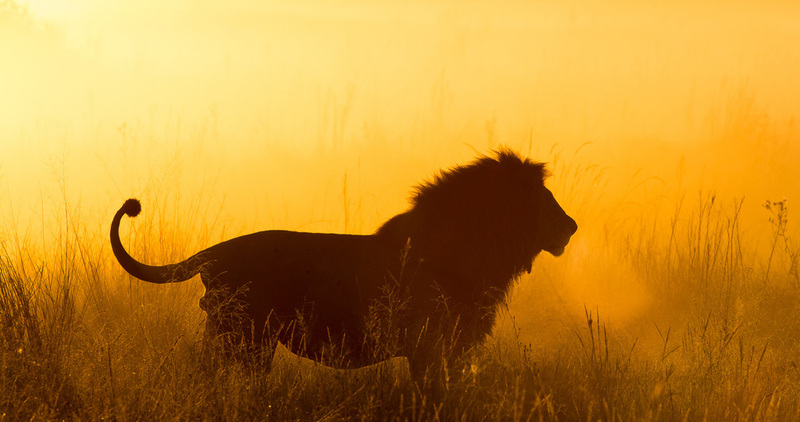 2 male lions popped out the bush and gate crashed the party… All this followed by a spectacular sunset without moving the car. That day proved to me once again that you have to be at the right place at the right time – anything can happen in the bush and the beauty of it is that we cannot control it. Alex was attentive and thoughtful and really appreciates his guests needs. Thank you Alex!! We will be back. I love being in the wilderness and sharing it with people from all over the world. I love learning about new cultures and sharing mine. I really like the quietness of the bush and the sounds of nature. In Savuti in 2005 long after my guests had tucked in for the night I went to my tent for a bucket bath. Guides bath out of buckets its quicker and easier than a bucket shower. I hung a paraffin lantern in the branch of a tree and placed my full bucket of bath water nearby undressed and soaped up, problem was a leopard also had intentions for the bucket of water. Savuti was very dry that year. She mock charged me to move away from the water but as I had soap in my face I never really could see properly, so I did not move. No problem to the leopard as I did not move she simply lay down not 1m from me. I called out to the camps staff but they ignored me thinking I was joking but I insisted and eventually they came to my aid by clanging some pots together and the leopard moved away into the darkness. She meant me no harm but really wanted the water… we left a bucket of water out for her and when we went back in the morning we found her tracks around our bucket. She got her water!